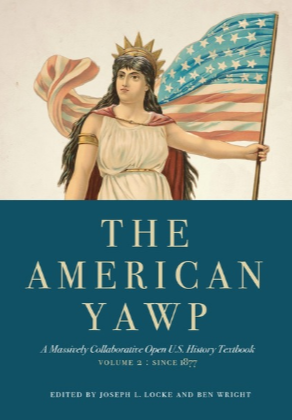 The American Yawp is a free, online, collaboratively built American history textbook. 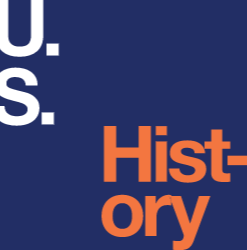 Over 300 historians joined together to create the book they wanted for their own students—an accessible, synthetic narrative that reflects the best of recent historical scholarship and provides a jumping-off point for discussions in the U.S. history classroom and beyond. 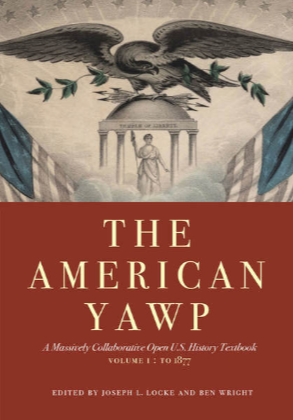 The Yawp highlights the dynamism and conflict inherent in the history of the United States, while also looking for the common threads that help us make sense of the past. Without losing sight of politics and power, The American Yawp incorporates transnational perspectives, integrates diverse voices, recovers narratives of resistance, and explores the complex process of cultural creation. It looks for America in crowded slave cabins, bustling markets, congested tenements, and marbled halls. It navigates between maternity wards, prisons, streets, bars, and boardrooms. The fully peer-reviewed edition is edited by Joseph L. Locke, Assistant Professor of History at the University of Houston-Victoria, and Ben Wright, Assistant Professor of Historical Studies at the University of Texas at Dallas. This book is available online at http://www.americanyawp.com/. Print copies are also available for under $30 each volume at the same website. 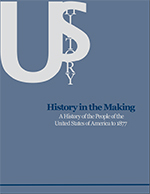 This textbook examines U.S. History from before European Contact through Reconstruction, while focusing on the people and their history.Prior to its publication, History in the Making underwent a rigorous double blind peer review, a process that involved over thirty scholars who reviewed the materially carefully, objectively, and candidly in order to ensure not only its scholarly integrity but also its high standard of quality.This book provides a strong emphasis on critical thinking about US History by providing several key features in each chapter. Learning Objectives at the beginning of each chapter help students to understand what they will learn in each chapter. Before You Move On sections at the end of each main section are designed to encourage students to reflect on important concepts and test their knowledge as they read. In addition, each chapter includes Critical Thinking Exercises that ask the student to deeply explore chapter content, Key Terms, and a Chronology of events. 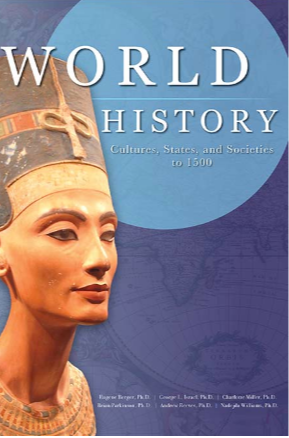 World History: Cultures, States, and Societies to 1500 offers a comprehensive introduction to the history of humankind from prehistory to 1500. Authored by six USG faculty members with advance degrees in History, this textbook offers up-to-date original scholarship. It covers such cultures, states, and societies as Ancient Mesopotamia, Ancient Israel, Dynastic Egypt, India's Classical Age, the Dynasties of China, Archaic Greece, the Roman Empire, Islam, Medieval Africa, the Americas, and the Khanates of Central Asia.It includes 350 high-quality images and maps, chronologies, and learning questions to help guide student learning. Its digital nature allows students to follow links to applicable sources and videos, expanding their educational experience beyond the textbook. It provides a new and free alternative to traditional textbooks, making World History an invaluable resource in our modern age of technology and advancement. Digital versions of this textbook are free and can be downloaded here. Print versions cost $29.99 through the same website.